Objective of this project – built up over 30 years – together with its worldwide cooperation partners: freeing the earth from violence and war. This is not a ‘great dream’ but a real historical possibility. Key aspects of our work: healing the collective trauma and build up of applicable prototype models, build up of an efficient global network, help in crisis areas. Previous operations in Bosnia, Middle East, Colombia, India. A concrete goal: Build up of futurological centres (World Peace Villages) and implementation of the ‘Global Campus’ with bases in all continents. If possible please help with this work and spread this information in your networks. In the name of all children. In the name of all creation. 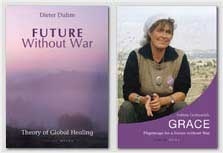 • Sabine Lichtenfels: GRACE - Pilgrimage for a Future Without War. A good day, Easter of the Resurrection, for an appeal to love. The messanger is less important than the message here, the words stand for themselves but if pressed I will be happy to reveal him. Happy Easter of the Resurrection, Christian Europe. I'm glad you liked it. Notice, though, that the article above - on the contrary of your message - is aimed to all people who read it and makes no distinction based on religion or other characteristic. I want to underline this. So happy Easter, or just a great weekend for everyone!! I hope you also liked the message, which was meant to complement yours, for its universality and independently of who sent it and which religioous views it expresses. Indeed love is universal but hard to believe in unless it incarnates itself in the particular. P.S. The message of Leo Tolstoy in War and Peace is universal independent of his beliefs or those of the readers. There was a slight problem however in the life of Tolstoy: he deeply loved mankind in the astract but could not find in him to be kind to his wife.